For small to medium-sized businesses, the digital age can be a confusing place when it comes to financing options. Managing traditional financing was fairly simple by today’s standards. In decades past, this was as simple as hiring an accountant to oversee your finances and a financial advisor for your investments. But in the digital age, your finances are just as complicated coming in as they are on the investment end. Cash flow problems are common, but so are good cash flow solutions. This handy guide can help you avoid them and stay on the path to profit. This is one of the most common cash flow problems businesses face. Sometimes clients can be slow to pay, which in turn passes the problem of cash flow from the client to you. This is especially true when more than one of your larger clients is slow to pay. Projected cash flow should account for slow pay and other client cash flow concerns. Planning for slow pay clients requires a twofold approach. The first step is to address the issue with clients. If the client is typically reliable but consistently slow, develop terms that encourage and reward faster pay. But if your client has an inconsistent payment record, it may be time to move on and make room for better clients who will keep their payment arrangements for years to come. The second step is reaching out for a stopgap funding source to bridge the 30-day to 60-day period when slow pay is a problem. When business is booming, this can seem like the perfect time to invest in growth. However, this is where many young businesses get into trouble. Exercise caution before you decide to spend impulsively on new resources for your organization. A profitable month doesn’t always indicate a consistent trend. Minor business downturns and slumps can also turn into serious problems if you have overspent. As a business owner, each purchase you make for your business needs to be carefully weighed and researched. Make sure to follow reviews and testimonials before investing in a new product. Even if you have invested wisely and avoided unnecessary expenses, you can still find your organization struggling with growth expenses that exceed income. One of the great challenges of a growing business is trying to accommodate larger clients and jobs. Businesses can easily find themselves accepting offers that require more staff or greater resources knowing the investment will soon pay off. However, the increased scale of business means added strain on your business as a whole, and your cash flow can take longer to catch up than expected. When it comes time to consider taking on work that will require adding staff or other expenses, be sure to fully explore the implications beforehand. Developing a complete understanding of what expenses this would mean and how quickly your cost increase will pay off can help you make the most informed decisions. This might seem like the most obvious of cash flow problems, but in reality, it’s much more complicated. The truth is that many businesses can take years to earn a profit. A good business owner or head of finance will understand profit as a gradual increase on an investment. However, consistently coming in under your projections for profit is not a sustainable business model. Even when your business has a perfectly solid cash flow projection and profitability, unexpected market fluctuations can become a headache quickly. You also need to plan for seasonal market changes that may repeat from year to year. When it comes to business in the Information Age, your cash flow and profit goes far beyond simple profit and payment projections. Cash flow forecasting takes simple projections to a deeper level, exploring data and analytics far beyond the raw numbers. Consider using cash flow forecasting services that give businesses the chance to break down the factors that disrupt the path to profit and solve them to get back on track for profit and success. I agree, When it comes to business having a cash flow makes the business more healthier for both owner and employee. Cash-flow in business is very important. I know when I have cash-flow issues in my business, this article is useful for me. Now I am running my business about design service, logo design, and graphic design. I hope I can learn with this article, so I say thank you very much. Hi Dana, remarkable post indeed. I own a construction management company and your good piece of advice has opened my eyes!!! thanks again. Expecting more of such posts from you. Thanks a lot and keep posting! Great post. I have started my own business! And through your article, you always get the inspiration to take your business to a height. Thanks for sharing. Great post, Dana. I can’t agree any less with you as I took note of your input on “slow paying clients.” The option you pointed out is look for ways to encourage the client to pay more on time. But if he is a habitual slow paying client, or if he doesn’t consent, it is a good thing to let him go and make room for others as Ryan Biddulph noted. 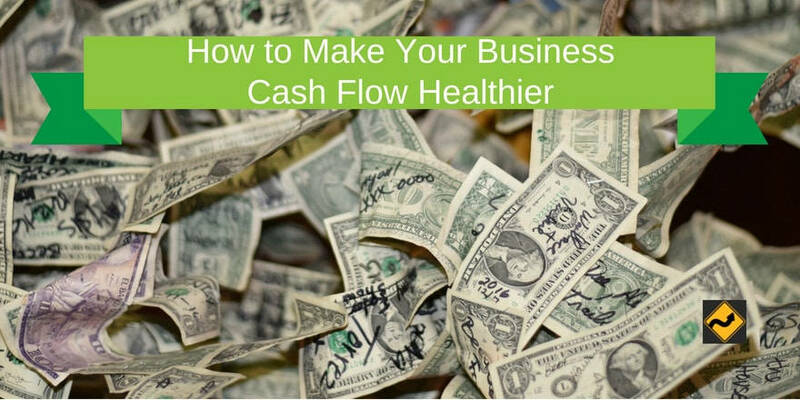 And although there are many ways to make a business cash flow healthier, I would like to add that separating your business and personal finances will also contribute to a healthier cash flow. If you’re mixing your business profits with your personal expenses, there is bound to be a glitch in your company’s flow of money in the long run. Make sure you open a business checking account for your startup so you can keep a better track of your business expenses and personal finances. Thanks for the informative post Dana. I totally agree with you but sometimes still its a bit difficult to manage the cash flow. I will keep all these tips in my mind. Another amazing post. I appreciate your effort in crafting this amazing post. keep up the good work. Good post, Dana. I am also running my own business and your advice is applicable to my venture right now. Hope to see more of these helpful reads. Dino would love you to read ..Chasing a previous call center agent’s success. Letting go slow paying clients is SUCH a good piece of advice Dana, after you see these folks habitually paying late or slow. Brilliant really. Because when you release late or slow payers, guess what happens? Your posture allows quick paying clients to find you that much more quickly. Creates an abundance vacuum but all is based on your willingness to let go the client to make room for more dough. Rocking tips here.